Circuit: LED Ceiling Night Light - July 4, 2017 __ Circuit designed by David A. Johnson, P.E. After 3 years of continuous 24/7 operation I noticed that the 20 LED array I was using as a night light next to my back door was fading. Some of the LEDs were much dimmer than others. 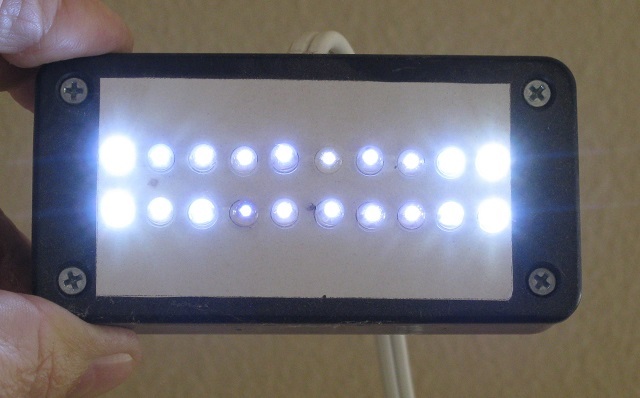 I figured that over time, the internal heat dissipated from the LED chip was causing the LED light intensity to fade. I decided it was time to replace the light. The light sat on top of a tall cabinet and projected a light pattern onto the ceiling. The light was bright enough to see my way to the back door without turning on any other light. I decided that since I had a surplus of white LEDs from Cree from another project, I could replace the old LEDs with new ones and mount the new parts to an aluminum heat sink. The added heat dissipation should extend the life of the LEDs. Twenty holes were drilled in a 1/8” thick aluminum plate. A bit of white silicone thermal grease was applied to the inside of each hole before pushing the 20 LEDs through the holes in the plate and the plastic light case. The standard T 1 ¾ style LEDs were all wired in series. A 1.0uF capacitance voltage dropper type circuit was used to generate about 60 volts DC to drive the LEDs with about 20ma of current. R2 serves as a current limiting device during initial activation of the light. A metal oxide resistor R1 acts as a fuse.